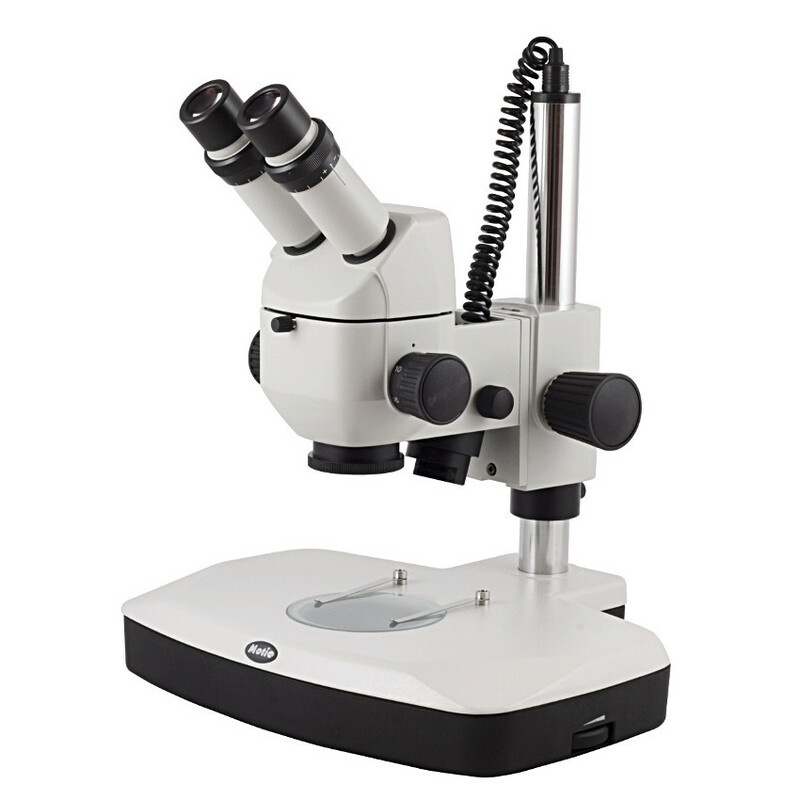 The Motic K Series stereo microscopes are high-performance, modular systems purpose-built for today's rapidly changing microscopy landscape. Engineered around a common main objective (CMO) and infinity optical system, the K Series delivers sharp, high-resolution upright images for observation and documentation. The modular design offers easy configuration and adaptation to a variety of working environments, ranging from routine manufacturing quality control to biological research and more. The Infinity optical system is fully parfocal and offers a crisp, three-dimensional upright image through a binocular head inclined 45 degrees and rotatable 360 degrees. 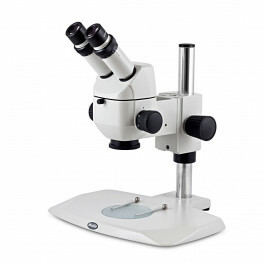 Super Widefield 10X FN 23 eyepieces offer 54mm-76mm of interpupillary adjustment and +/- 5 degrees of dioptric adjustment, allowing fatigue-free viewing for multiple users. An achromatic 1X objective is housed in a 5-position turret magnification changer with click-stop detents to ensure precise, repetitive observation at 6.4X, 10X, 16X, 25X, 40X magnification. A generous 89mm (3.5") working distance offers ample room for handling specimens under observation. Dual rack and pinion focus controls are conveniently positioned and feature tension adjustment for responsive and predictable movement. The 2112 is an economical plain stand featuring a 32mm vertical post and a wide platform base with an expansive 330mm x 280mm working surface and chemical-resistant finish. Black/white and stage plate and 2 spring clips are included. Accessories include a manual and dust cover. The Infinity optical system is fully parfocal and offers a crisp, three-dimensional upright image through a binocular head inclined 45 degrees and rotatable 360 degrees. Super Widefield 10X FN 23 eyepieces offer 54mm-76mm of interpupillary adjustment and +/- 5 degrees of dioptric adjustment, allowing fatigue-free viewing for multiple users. An achromatic 1X objective is housed in a 5-position turret changer with click-stop detents to ensure precise, repetitive observation at 6.4X, 10X, 16X, 25X, 40X magnification. A generous 89mm (3.5") working distance offers ample room for handling specimens under observation. Dual rack and pinion focus controls are conveniently positioned and feature tension adjustment for responsive and predictable movement. 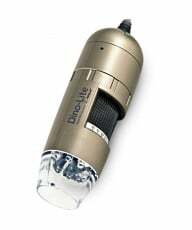 Incident and transmitted illumination is independently controlled by variable intensity, 12V10W halogen. The FBGG stand features a 32mm vertical post and a wide platform base offering a large, 330mm x 280mm working surface with chemical-resistant finish. Transmitted 12V10W halogen illumination from an integrated 110V - 220V universal power supply is standard. Black/white and frosted stage plates and 2 spring clips are included. Dual rack and pinion focus controls are conveniently positioned and feature tension adjustment for responsive and predictable movement. 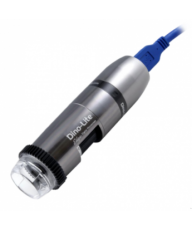 Incident and transmitted illumination is independently controlled by variable intensity, 3W LED. The FBGG stand features a 32mm vertical post and a wide platform base offering a large, 330mm x 280mm working surface with chemical-resistant finish. Transmitted 3W LED illumination from an integrated 110V - 220V universal power supply is standard. Black/white and frosted stage plates and 2 spring clips are included. 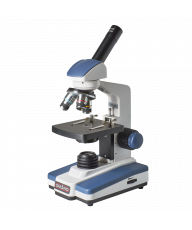 The Motic K Series stereo microscopes are high-performance, modular systems purpose-built for today's rapidly changing microscopy landscape. Engineered around a common main objective (CMO) and infinity optical system, the K Series delivers sharp, high-resolution upright images for observation and documentation. The modular design offers easy adaptation with elements like an optional photo/video tube to document a variety of working environments, ranging from routine quality control to biological research and more. The Infinity optical system is fully parfocal and offers a crisp, three-dimensional upright image through a binocular head inclined 45 degrees and rotatable 360 degrees. Super Widefield 10X FN 23 eyepieces offer 54mm-76mm of interpupillary adjustment and +/- 5 degrees of dioptric adjustment, allowing fatigue-free viewing for multiple users. An achromatic 1X objective is housed in a 5-position turret magnification changer with click-stop detents to ensure precise, repetitive observation at 6.4X, 10X, 16X, 25X, 40X magnification, 89mm (3.5") working distance and 36mm max. FOV. Optional eyepiece and objective lens combinations offer 1.0X - 256X total magnification. The K-500 is available here with a choice of two popular bases, the economical 2112 plain base, or the FBGG base, available with 12V10W halogen or 3W LED illumination. Each stand features a 32mm vertical post and a wide platform base offering a large, 330mm x 280mm working surface with chemical-resistant finish. Black/white and frosted stage plates and 2 spring clips are included. For additional mounting options, please call 877-409-3556. Motic Part # Plain Base Model: 1100200900231; Halogen FBGG Base Model: 1100200900211. 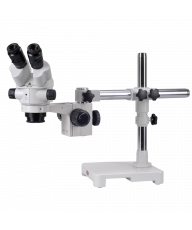 The Motic K Series stereo microscopes are high-performance, modular systems purpose-built for today's rapidly changing microscopy landscape. Engineered around a common main objective (CMO) and infinity optical system, the K Series delivers sharp, high-resolution upright images for observation and documentation. The modular design offers easy adaptation with elements like an optional photo/video tube to document a variety of working environments, ranging from routine quality control to biological research and more.OpticsThe Infinity optical system is fully parfocal and offers a crisp, three-dimensional upright image through a binocular head inclined 45 degrees and rotatable 360 degrees. Super Widefield 10X FN 23 eyepieces offer 54mm-76mm of interpupillary adjustment and +/- 5 degrees of dioptric adjustment, allowing fatigue-free viewing for multiple users. 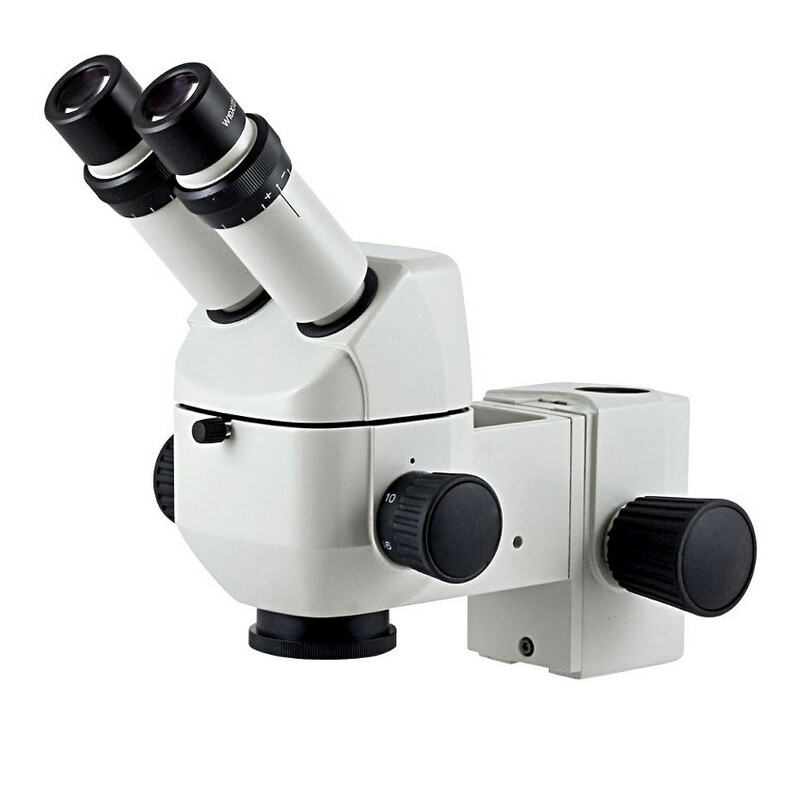 An achromatic 1X objective is housed in a 5-position turret magnification changer with click-stop detents to ensure precise, repetitive observation at 6.4X, 10X, 16X, 25X, 40X magnification, 89mm (3.5") working distance and 36mm max. FOV. 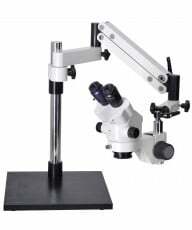 Optional eyepiece and objective lens combinations offer 1.0X - 256X total magnification.FocusDual rack and pinion focus controls are conveniently positioned and feature tension adjustment for responsive and predictable movement.The K-500 is available here with a choice of two popular bases, the economical 2112 plain base, or the FBGG base, available with 12V10W halogen or 3W LED illumination. Each stand features a 32mm vertical post and a wide platform base offering a large, 330mm x 280mm working surface with chemical-resistant finish. Black/white and frosted stage plates and 2 spring clips are included. For additional mounting options, please call 877-409-3556.AccessoriesAccessories include a manual and dust cover.Motic Part # Plain Base Model: 1100200900231; Halogen FBGG Base Model: 1100200900211.